A small debate began on Twitter last night that I thought I’d like to expand. When do you put your Christmas tree up? Is it a symbol of Advent or of Christmas itself? My family were always pretty disorganised and the tree would not go up until Christmas Eve. Although since the Twitter discussion, where there some pretty strong proponents of Christmas Eve tree decorating, I’m not sure that it was only because of disorganisation. Since I got married, in a spirit of marital compromise (the Vicar comes from an early tree family), the tree has gone up earlier, and now the official date is as soon as we’ve bought our tree (always real, natch) and as early as possible after the Engineer’s birthday, which is 5th December. So this year, we may spend the afternoon of the Engineer’s birthday purchasing the tree, and possibly even decorating it. So what do you think? Leave a comment if you’d like to explain! Advent has begun and with it our annual attempt to learn the whole of Matthew’s genealogy of Jesus off by heart. This is not quite as difficult as it sounds, as we have been aided by Andrew Peterson’s excellent song, found on his wonderful Christmas album ‘Behold the Lamb’ (only £4.99 at Crossrhythms). I think we now have about 85% of it nailed. This year I want us to get past Eliakim. 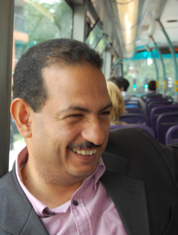 Sherif Hassan is a friend of Mark Meynell, an old pal of ours from Cambridge days and Senior Associate Minister at All Souls Langham Place, that great multi-cultural church in the West End of London. Sherif was married to Emma at All Souls this summer and they went to visit Sherif’s family in Egypt on 9th November. On arrival in Cairo, Sherif was detained and Emma was deported back to the UK. Since then Sherif has not been seen, and Emma has managed to speak to him only once, on 26th November. She has been told that the authorities are threatening to detain him for three years. She has had no response to her enquiries at the Egyptian Embassy and the Egyptian Consulate in London. Neither Sherif nor Emma have a criminal record and no charges have been brought against him. There is a great worry that his detention is to do with his Christian faith. To find out more, go to the website that Mark has set up. Please pray for Sherif’s release, pray for Emma and the wider family and pray for the Egyptian authorities to act with wisdom and fairness. Do write to your MP, to William Hague or to the Egyptian ambassador. Use the hashtag #ReleaseSherif if you tweet. Over the last few days I have been almost continually thwarted in my aim to join the masses in shopping for Christmas presents. Last week I went down with an exhausting virus which scuppered my romantic plan to insist that the Vicar joined me in the purchasing scrum on his day off. And then yesterday I had lined up a bunch of exciting gifts online, just waiting for my dearly beloved to return from a training day to nod his approval to the final clicking of the mouse. I was supervising the Queen’s homework in the meantime and thought I would seize the day and actually clear the draining board in the kitchen for once. I was obviously feeling too enthusiastic, as I was seemingly too vigorous with my drying up and managed to inflict a torsion failure on the stem of a wine glass. The broken stem then sliced into my thumb, causing spurts of blood to decorate the kitchen floor. It wasn’t very painful, and hasn’t been since – nothing that a couple of paracetamol won’t sort out – but it has been enormously time consuming. The upshot of this has been that I have so far failed in my Christmas shopping quest. Instead I have spent over 12 hours in two A&E departments in the last 24 hours. And I am still not fixed. I managed to damage a nerve in my thumb and will be going back to hospital later this week to have some intricate needlework performed to give the nerve the best chance of recovery. Last night we didn’t get back until 2am. 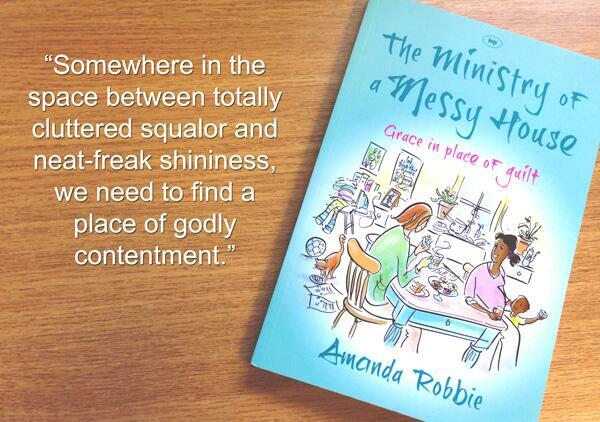 As the wife of a busy Vicar who is often out in the evenings, I often wish we had more time alone together. But Sandwell General A&E doesn’t cut it for me. I’m going to have to think of a better way of getting him to myself. Also, I think this is a sign that I should do less housework, or at least no drying up ever again. World Toilet Day – Come Celebrate with Me! If you’re a regular visitor here at the Vicarage, you probably know that back in those hazy days before children and keeping warm loomed large in my day, I used to design sewage works (among other things water-related). One of the odder hang-overs from those days is that I still often notice sewage works as I’m driving around, and especially if I travel by train (railways often follow rivers and that’s where many sewage works are located). Thanks to Twitter, I’ve discovered that tomorrow, 19th November, is not only BBC Children in Need day, but has also been designated ‘World Toilet Day’. So my kids are going to school in spotty hankies tomorrow. But for today, here is Dancing in the Loo. When I had a surplus of leftover gammon the other week I made two very pleasing dinners for the family, as well as sending the kids to school with gammon sandwiches for half the week. The second recipe I tried was this Spanish hotpot, an extrapolation from a suggestion from a Twitter pal. This was so popular that the kids were begging me for extras, even when it was all finished up. I shall be making this again, with chorizo or bacon if leftover gammon is lacking. Fry the onion in a casserole dish until soft and translucent. 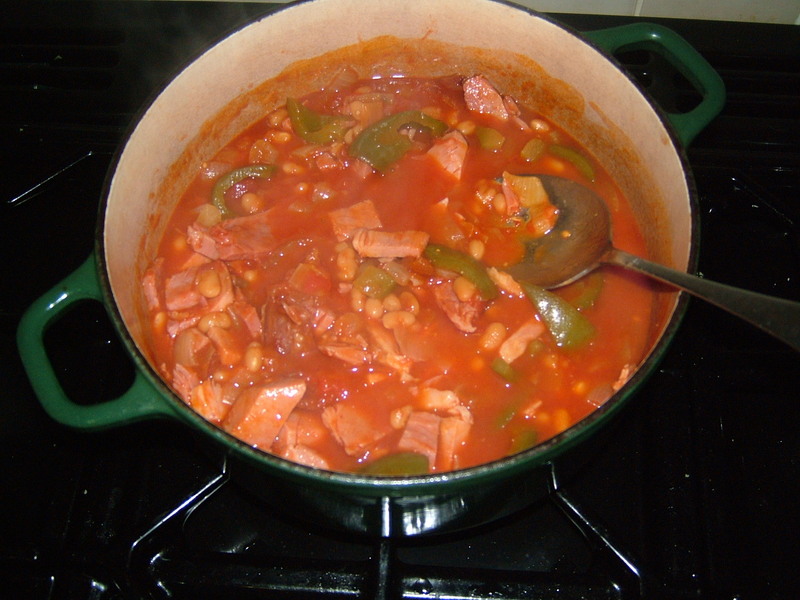 Then add the pepper and gammon, the tomatoes and the beans, together with the smoked paprika. Add water to cover the ingredients and simmer for about 20 minutes until the peppers are soft. Serve with rice or crusty bread. It is the smoked paprika that makes this taste particularly delicious, although you could use the unsmoked variety if you haven’t got the smoked. Other options for this dish would be peppers of other varieties, different varieties of pork – bacon or chorizo perhaps, cannellini or haricot beans rather than baked (maybe add some tomato puree instead), and olives might be good too. Our kids are happy in our church school here in the parish. The teachers are kind and dedicated and are working hard to make it better and better. The school is in a disadvantaged area and it can be hard to ensure that all the children learn to their full potential. But the staff are tackling difficulties one by one and making a real difference. One of the obstacles that our current school faces is a building built for a smaller school (2/3 of its current size) and built at a time when open plan classrooms were all the rage. Our building isn’t bad – it’s clean and well maintained. We’ve recently had a refurbishment of the Foundation Stage area which is fantastic. We have a wonderful school allotment and many other great outdoor facilities. I am thankful for many blessings there.